You must make reservations at least 5 minutes in advance of the time at Mio Nonno Trattoria - Victory Park. Laid-back eatery serving wood-fired pizzas, classic & updated Italian fare, wine & cocktails. Roasted Heirloom Tomatoes, Burrata cheese, Basil, E.V.O.O. San Marzano Tomatoes, Fresh Mozzarella, Basil, Pecorino, E.V.O.O. 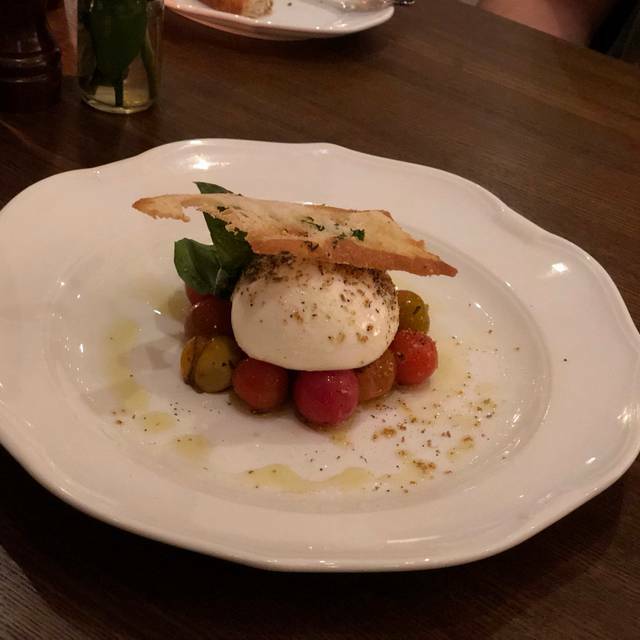 Oven Roasted Cherry Tomatoes, Burrata Cheese, Basil, E.V.O.O. Fresh Mozzarella, Cherry Tomatoes, Prosciutto di Parma, Arugula, Parmigiano Reggiano, E.V.O.O. We made reservations and when we got to the restaurant they told us that reservations were sat at the bar. There was only one other couple in the whole restaurant. When I made reservations I assumed it would be for a table. The servers were nice and the food was good but it seems you have to be a regular or “someone of importance” to get great service. It’s a nice restaurant. We did see some people leave when told they had to sit at the bar. That’s too bad. There are a lot of good restaurants in the area. We will just go to one that treats everyone equally. Delicious food and great service. Loved the outdoor seating. Only issue - Music was too loud. Service was very slow and staff seemed overwhelmed. Food which was just pizza took 40 minutes from time of order. But must surprising was being charged 3$ rocks fee to add ice to a $10 drink. I have never seen this ever at a restaurant. I will never be back. Too many other options or else I’ll bring my own ice. I love this place! 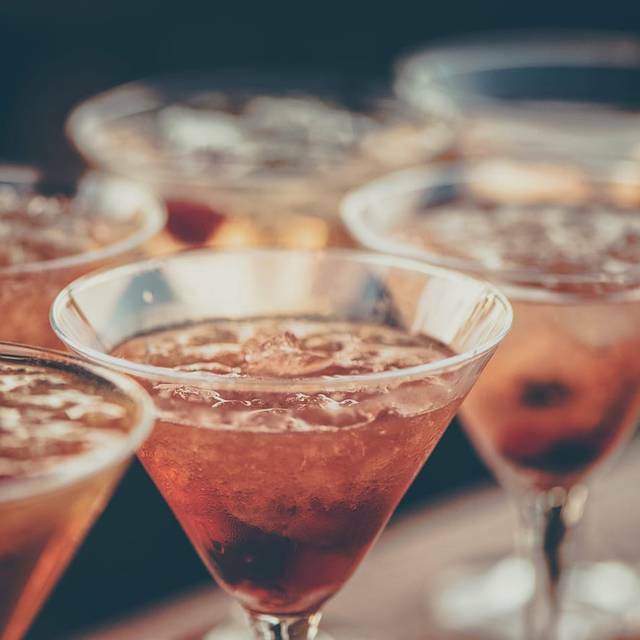 It’s a great combination of bar and dining in. The DJ knew his audience and played music at a good level and the drinks and food are incredible. Definitely worth going again! Very slow service. Kitchen can’t keep up with demand nor the bar. 2.30 hours for dinner. It’s Italian not that hard. Really loved the gnocchi! Had another pasta dish (Russia) as well. It was great, though listed as spicy in the menu and it wasn’t. Would definitely return to this restaurant. If you're looking for a yummy place that has great service - this is it. We've enjoyed Mio Nonno Trattoria a few times now and it simply does not disappoint. The service is great - and friendly - but the food is just delicious. And they don't rush you, but they'll help move things along in case you have after-dinner plans across the street, at the AAC, for instance. It's really helpful that they take reservations also! Go there for a great dining experience. Service is always great and the food is delicious. It is really kind of a hidden gem. It is easy to get into now but as soon as people start finding out about it, I am sure we will have to start making reservations earlier. I was not thrilled to see another Italian restaurant come into Victory because I thought we had enough but this is not your typical red sauce Italian restaurant. 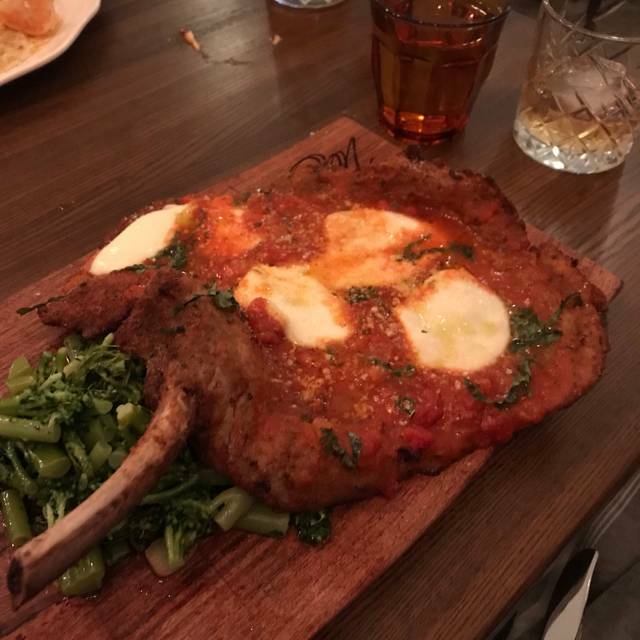 They have wonderful, unique Italian dishes that you don't get just anywhere. Check it out. You will be glad you did. They also have a great patio! The food is great, excellent brick oven pizza and every diner at our table loved the food. BUT, the food service is very slow, especially if you’re trying to eat before an event at the AAC. Our first course salad took 35 minutes to get to the table, dinner for four took 65 minutes from the time we ordered. Way too long. This restaurant caters to the pre-event AAC crowd and needs to staff the kitchen accordingly. The server kept apologizing, but no manager ever appeared. We had to shovel down our food and run to the game, despite timing our reservation where we should have had plenty of time. We were seated immediately when we arrived, table ready. After that things hit the brakes hard. It’s a shame, because the food quality is excellent and the covered outdoor seating is fun. If you’re planning to eat here before a show or game - leave plenty of time until they figure this out. Took at least 45 minutes to bring our food. Thought we would give this place another chance with it being so close to the arena. Well it was disappointing again. Started out fine, drinks and salad but we went with the server’s suggestion of the burrata pizza.. it was not good at all. Everything but the edges was soggy, there was not any basil on it as described on the menu, and the cherry tomatoes consisted of 4 narrow strips of what may have once been a cherry tomato. The server did not return back until he brought the check. We told him our assessment of the pizza and he said well it isn’t regular pizza, you are supposed to roll it up when you eat it. Hmm- maybe if he came back to check he could have shared that with us, or better yet before he took our order! It was the perfect pre-game meal. Max was our server and he was patient when we (okay "I") had questions and was prompt with our drinks and food. We really enjoyed our time there and the food was delicious. We all agreed that while this was our first time trying Mio Nonno Trattoria, we definitely want to visit again. Favorite Italian food in Dallas! Everything on the menu is excellent - you can't go wrong at Mio Nonno! This was our first time to experience Mio Nonno, translate My Grandfather. The Polenta appetizer was very good as well as the two entrees, Russia and the Lasagna. Moi Nonno is a perfect place to dine before an American Airlines Center event. I prefer the menu at the Allen location. The pizza with arugula and prosciutto was a weird combination that just didn’t work for me. Music was too loud. Wine pour was skimpy for price charged. Our first time here but not the last! The food was remarkable, the drinks were cold and strong. The entire staff was available for anything we needed. Getting the food was quick and easy. The waitress was a little snotty.. I used to be a waitress so I would just them to be kind and smile. I can't wait to go back though! More energy than the North Dallas locations but still great food and service. Only issue was the Caesar salad had way too much mayo. We practically live here because we go to the hockey games. Won’t eat the garbage inside the arena, so get great meals before every game. LOL. Love that the servers and Tony remember us. The ambience is like a NY restaurant, filled with ppl enjoying meals, great drinks and remarkable service. So glad Mio Nonno opened on Houston St! You make us feel like family. Absolutely love this place! Tony is the greatest! Very welcoming staff and great service. Quiet evening, there weren’t many patrons on a Wednesday night, but overall good experience. Tony and the crew are first rate. Some of the best Italian cuisine in Dallas. As a native New Yorker, I highly recommend. It took an hour to receive our entree and mine was cold. They comped that entree and then asked to buy us a drink. The drink offer should have come while we had that long wait, not after. The food was so-so. Absolutely love the food here- normally a great experience but must have been a really busy night because it took us nearly an hour to get our food out and we were late for the mavs game next door. Will still go back and try again, pasta is the best in dallas and all restaurants get slammed sometimes. Good food, great location, but the service was slow between the time we ordered and when the food arrived -- about 40 minutes. It caused us to miss the start of the Stars game. They were either short staffed or otherwise unprepared or disorganized. It took over an hour for our party to get our entrees. The music they were piping in was way too loud. We could barely hear each other at our table. Outside of the slow service, the food was good. We may give them another opportunity in the future, but we will also seek out other dining in the area of the American Airlines Center. The Crema is SO GOOD!!! Definitely will be going back just for that dish! We dined here last night. We enjoyed everything we had. We ordered. Two of us ordered Russia- DELICIOUS!! Pasta was perfect and the dish had a great flavor. Sauce was perfect! I ordered Nonno’s this was a great dish too! The shrimp was perfectly cooked, the sauce was excellent - great flavor and not too much sauce. For dessert we ordered the Tiramisu- this was completely INHALED as soon as it was placed on the table! 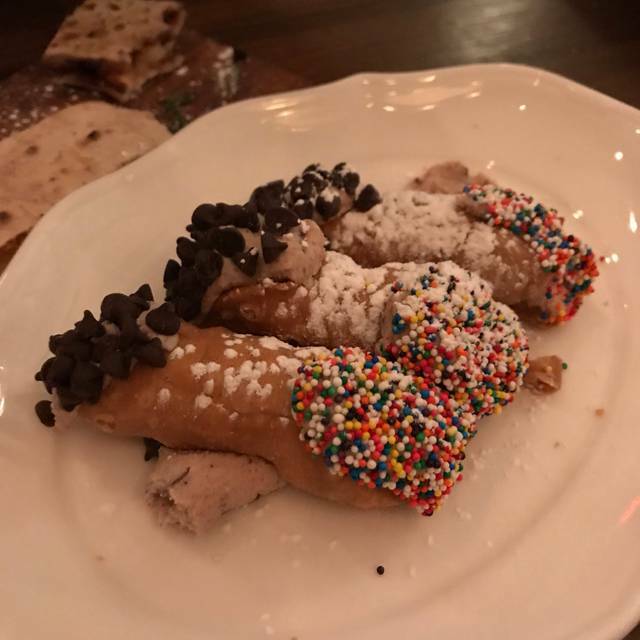 The Cannolis were a little too lemony for my taste - the order was 3 mini cannolis one was pistachio —- INCREDIBLE —- the other two were more traditional cannoli’ s one with chocolate chips the other with rainbow nonpareils - both of those too lemony for MY taste but I ABSOLUTELY LOVED the Pistachio one! The prices are on the higher side, the portions were good. I would recommend everything I ate. I would like to come back to try the Vongole!! Manager tried to rush us through ordering our entrees. Thought that was a bit odd. She claimed it was due to a large party about to arrive. You won’t find a better staff at a restaurant in Dallas - if you want treated like family, and a great meal along with the experience, you won’t be disappointed. I would absolutely recommend this place. From the atmosphere to the service to the food. We had the Cioppino, Linguini with Clams, Sea Bass and the Cheesecake. All were fantastic! Can’t wait to go back and try the pizza. The food was exquisite! Might be the best ravioli I’ve ever put in my mouth! The owner stopped by and talked a little about how they prepare a few of the dishes we ordered. There was a live DJ. Made it a little loud for my taste, but we were still able to have a conversation over dinner. Wonderful experience! We were there prior to a Mavs game and they were very efficient in service and quality! We will go for every Mavs game! So convenient to walk across the street to the stadium. I LOVE the one in Flower Mound and, although this one is a bit different overall, I still LOVED the food and staff! The ambiance is a bit brighter (not as cozy) as FloMo's but I would still go again! My daughter and I went for the first time. 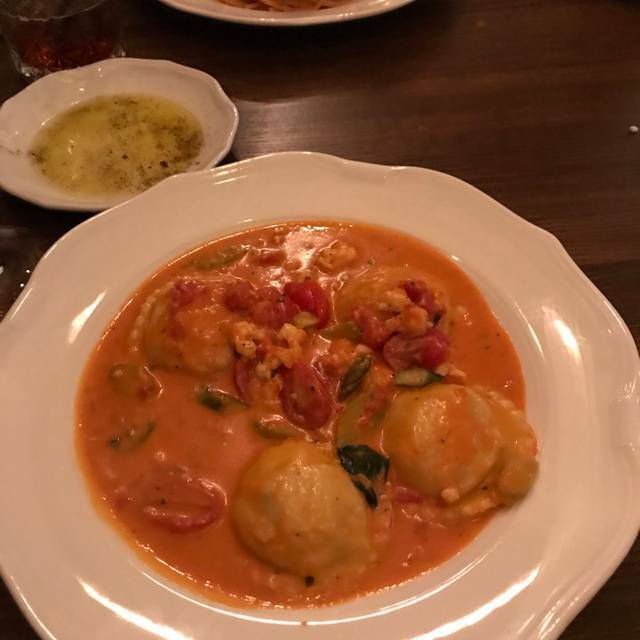 We had the best homemade lobster ravioli we have ever had! Specialty drinks were great too! We will definitely go back! Overall great visit. Food, drinks, and dessert was all excellent. Felt a little rushed to flip the table, but to be expected at a hopping place like that. Will definitely return in the future.